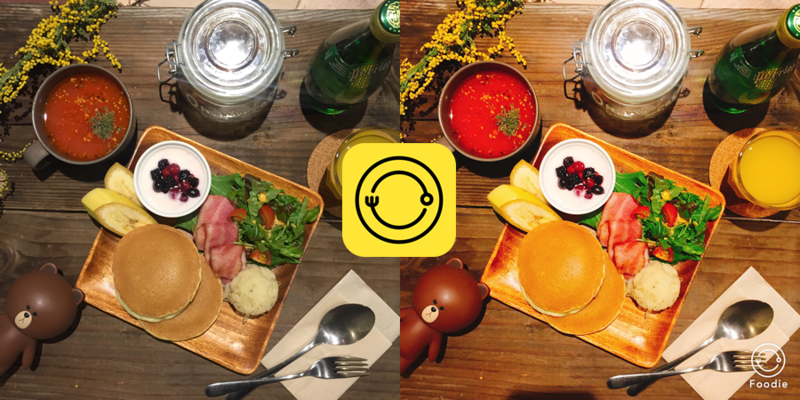 Tokyo, Japan – February 16, 2016 – LINE Corporation has announced the release of "Foodie," a new camera app available for free on both iPhone and Android devices, dedicated to taking delicious photos of food. Foodie is a new specialized camera app that follows the example set by, the selfie dedicated camera app B612 that has surpassed 100 million downloads worldwide. Foodie offers a cornucopia of features with a singular goal: to make food pictures look more delicious. Its 24 types of food filters are sure to make foods such as "Meats," "Sushi," "Cakes," and other cuisines look delicious. Since the app's "best angle" feature lets the user know through color when the camera is positioned horizontally above the subject, it's a snap to take trendy flat lays like you'd see in a gourmet magazine. What's more, the app includes features like an auto blurring effect to give images the air of SLR photography, as well as brightness adjustment and flashlight features to increase your shooting options. Foodie also offers the basic features expected of a camera app including sharing to social networks like Instagram and Twitter. Going forward, Foodie will continue to develop food-specific features, such as filters and effects, that allow users to have more enjoyable and enriching communication experiences through food photos.